That's Scarlett, heading straight out the doggie door. She has gotten so fast, we can barely catch her (and have had to go looking for her more than once.) She doesn't care if it is cold and dark in the garage, or if dogs are waiting on the other side. It has become a game of chase, and most days, she is winning! This week's appointments included a visit to the neurosurgeon and audiologist. Her neurosurgeon is very happy with her healing after her surgery in December, and does not need to see her for 6 months. We have never gone 6 months between neurosurgery visits, so I will keep my fingers crossed that we can stay away that long. Audiology brought more good news. Her hearing has been difficult to test for the last two years, as she was too young to rely on behavioral results - gauging her hearing levels based on her reactions to tones played through big speakers. We have done several ABRs, which test her brainstem response to different sounds, but they require anesthesia, and are therefore much more dangerous. A few months ago, we decided to switch audiologists, and it has made all the difference for getting more detailed and accurate information about her hearing. The new office is able to do much better behavioral tests, and measured her hearing as slightly better than in previous tests - moderate, rather than moderate-severe. It's a minor difference, and doesn't change what we are doing with her hearing aids or school, but gives us a better idea of what she actually hears. On Friday, she began Round 2 of chemo (her third dose in the twice-a-month plan). 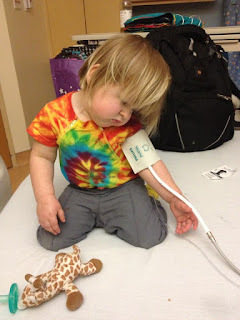 The appointment was not until 12:40, and then with the typical delays (and the non-typical, like waiting for Scarlett to produce a urine sample), the actual infusion did not start until nearly 3:00pm. We did everything we could to entertain her for the hours she was trapped in the bed, but her favorite game was "Throw everything on the floor so mommy or the nurse have to rinse it." Fun! Her psychedelic t-shirt is from ComfyCozys. They make shirts for kids undergoing chemo who have port catheters. There are two zippers on the chest to allow access to her port without having to strip off her clothes, as well as holes in the side seams to allow the wiring and her feeding tube to come through untangled. It worked great, and we are very thankful to Lorraine from ComfyCozys for getting us the shirt so quickly after we heard about it from one of our readers. At the end of a very long day, Scarlett showed us just how far she has come in this journey. The nurse had to take her blood pressure before discharging her. Scarlett stretched out her arm and held it still for the entire squeeze. When the machine stopped, she pulled at the velcro to take it off. It left me with mixed feelings - she is so relaxed and agreeable, which I love and am grateful for. However, no toddler should be so used to a blood pressure cuff, or should need a special onesie that allows access to all the medical access points. It's just another reminder of how different her life is than we ever imagined it would be. I love her scrunched up little nose when she smiles! She looks like she is pondering doing stuff she shouldn't be doing! So happy to see that Scarlett is doing so well with her chemo, and what a blessed curse with the blood pressure cuff, I totally understand what you mean by that. So nice to see an update from you. :) We are still rooting for all of you! Lol! Love seeing her crawl through the doggie door. She's fearless!! I'm glad to hear she is doing well with her treatments and she is not fighting the routine. I do think it is pretty funny how she is trowing her toys for you and the nurse to go get and clean ;P I believe she is one very smart young girl. You have an amazing daughter. I am glad to read that treatments are going well. Prayers for continued good news coming your way! The last sentences were just what I was thinking. Seeing her lay so nicely in the bed just broke my heart. She is a miracle, in every way. Scarlett is wonderful in every way. I can’t imagine that such a young girl has to go through so much. It’s heartbreaking, but I hope that you remain strong because she gets her strength from you too. But it is a blessing that her results have been constantly improving. I wish nothing but the best for your family.